Apple’s Flagships: Fabulous Or Fail? On September 10th, Apple unveiled their new flagship devices, the iPhone 5S and the low-cost iPhone 5C. This certain keynote was special because of the fact that they announced two phones. Since the release of these devices, the demand for them has caused these phones to fly off the shelves as soon as they arrive in store. The S series of iPhones really only have under the hood improvements such as upgrades to the camera, processor, or some software upgrades. The iPhone 5S however packs a new technology, the fingerprint sensor. The sensor works by essentially taking a high resolution picture of the finger as it powers the circuit inside. The fingerprints are scanned through the settings application and can have multiple fingers stored. These new sensors can use the fingerprints to set as pass codes or to verify iTunes purchases. Some other improvements include a new 64-bit processor deemed “A7”. To accompany the A7 processor is a new motion sensing coprocessor fittingly named the M7. Although iOS 7 came with an upgraded compass application, the M7 coprocessor seems to have failed in its job. The measuring of levelness is just off by about 2-4 degrees. However, Apple appears to have covered their buggy foot steps and patched this up in iOS 7.0.3. Another major update is the camera. The camera on the iPhone 5S sports a new fifth aperture to increase the amount of light let in to the photo. The LED flash has been doubled, and includes a warm color flash to help with light enclosure. As well as upgrades to the camera, the camera application has gotten a 5S specific update. A special “burst” mode takes multiple pictures at 10 frames per second. There has also been a slow motion mode added that takes video at 180 frames per second and can be edited into normal video footage. The new 5S has a new champagne gold metal finish which has been extremely popular. The other flagship device, the iPhone 5C is a cheaper version of the previous iPhone 5. 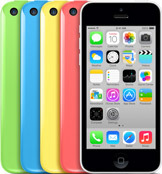 It comes in 5 new plastic casings (blue, yellow, pink, white, and green) which are lined with an aluminum frame. There are small improvements to battery life and not much else. Having the plastic covering, it increases the durability of the phone. The new iPhones sport all new cases. The iPhone 5C has a special case which matches all of the colors, and includes a black one. The new case has an array of holes in the bottom back section to provide expression of colors. The iPhone 5S comes with a variety of different colors (brown, beige, black, blue, and yellow) and a special PRODUCT(red) case. These cases are leather on the outside and lined with a microfiber material inside. These new iPhones come with iOS7 pre-installed. The iPhone 5C has special designs on iOS to fit the color of the iPhone. Both of the devices come unlocked and with contract. The iPhone 5S starts at $199 for phone and contract, with a $649 price for the unlocked version. The iPhone 5C starts at $99 for phone and contract, with a $549 price for the unlocked version. The iPhone 5S is a very professional and business-class type of phone, where as it’s duo, the iPhone 5C seems very contrary. The iPhone 5C appears to be a phone to go with younger generations and very expressive and colorful. These new phones are a great new addition to the rebirth of Apple’s design.